I was watching the penultimate episode of Top Chef last night and something one of the cheftestants said, really stuck with me. Over the past few seasons, the final four chefs have been sent home for a refresher prior to the finale which takes place in some exotic, or special location. This year the chefs traveled to Singapore for the first ever international rendition of the final episodes and the challenge of identifying, and using foreign ingredients clearly affected some of the chefs more than the others. But when faced with this problem, Kelly took solace in tasting. As she proclaimed, her cooking style is rooted in balancing flavors, no matter what the ingredients. Which when broken down, is the best advice any cook could take, no matter how well, or how often you find yourself in the kitchen. And it’s that balance of flavor that you know I strive for. 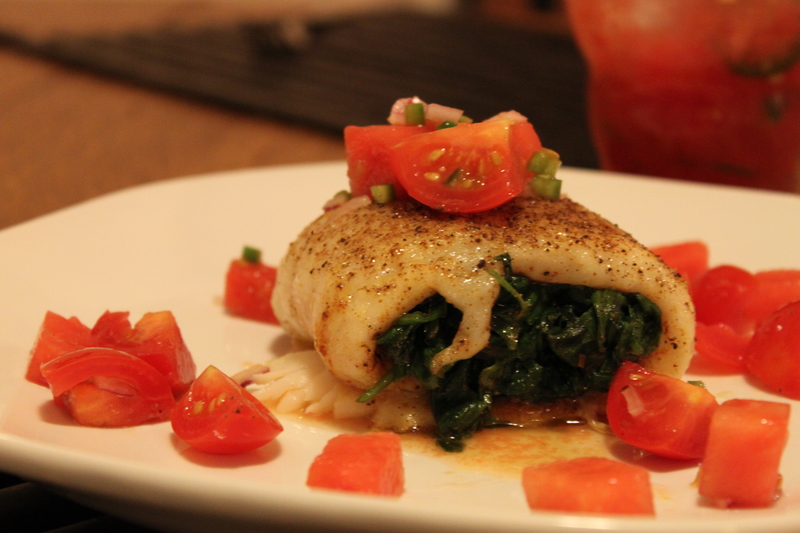 This watermelon, jalapeno, and vodka cocktail along with the spinach filled flounder topped with a watermelon and tomato salsa took this balancing act to the next level. 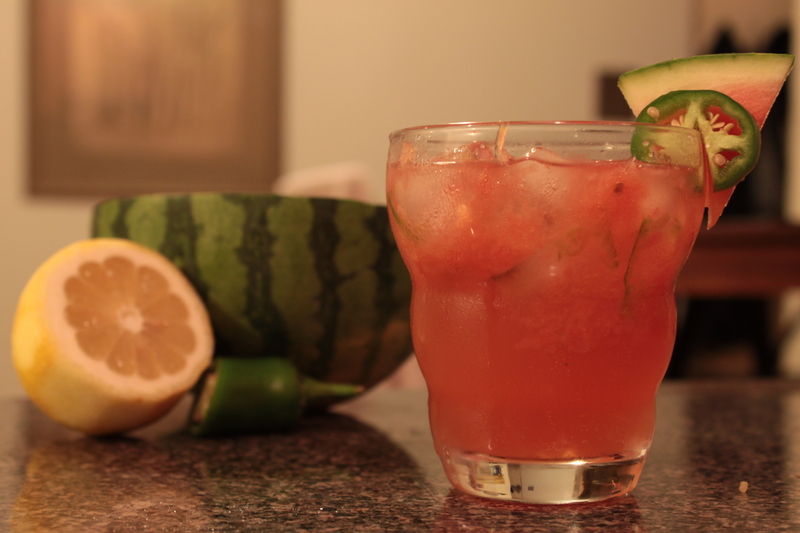 On their own, the drink and the meal each had a wonderful combination of acidity, spiciness, and sweetness. But together, the sum was much more than the parts. The pairing was a home run! So next time you find yourself following a recipe or freestyling your dinner, taste, taste, taste, and then taste some more. And if something is missing, trust your instincts to find that balance! What would Bobby Flay do? I think some of the coolest eating experiences are the eye-opening moments where sweet and salty find a perfect balance, particularly in some non-traditional situations. Now, it’s funny to think how much food has changed and how much of what seemed “non-traditional” when our parents were growing up, is now pretty common place. 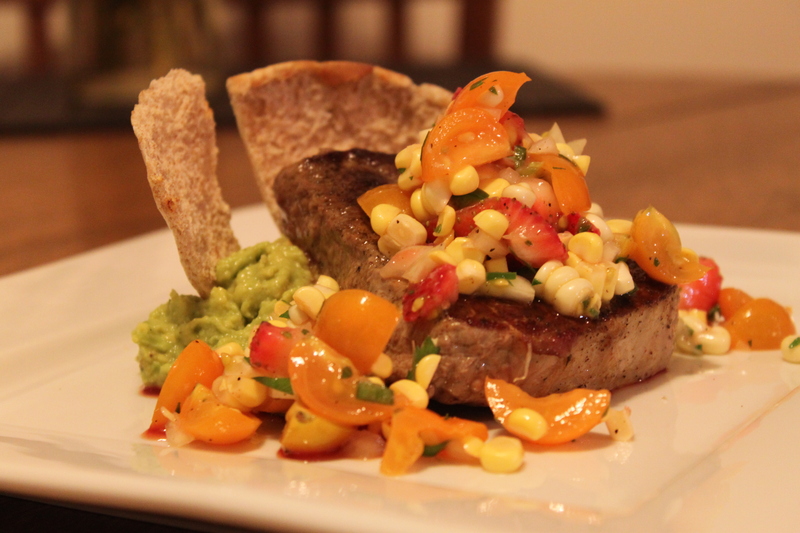 Thanks to Bobby Flay we have mango salsa! (Kidding) But all joking aside, fruit has a place in savory dishes, and it’s place can make or break a plate of food. Watermelon is a perfect example. The majority of its consumption comes from giant picnic slices and depressing fruit salads. But it’s a fruit that pairs extremely well with salty components. For example, last year when I paired watermelon bites with creamy feta cheese at a cocktail party, there were those that were a bit reluctant. But once they dove in, it was the first app to go. So when I got my second watermelon in the CSA this week along with a dozen beautifully orange tomatoes the first thing I thought of was salsa. Diced tomatoes, onion, watermelon, and minced parsley made up the base of this topping that balanced acidity, sweetness, and saltiness in a way you can only hope for. 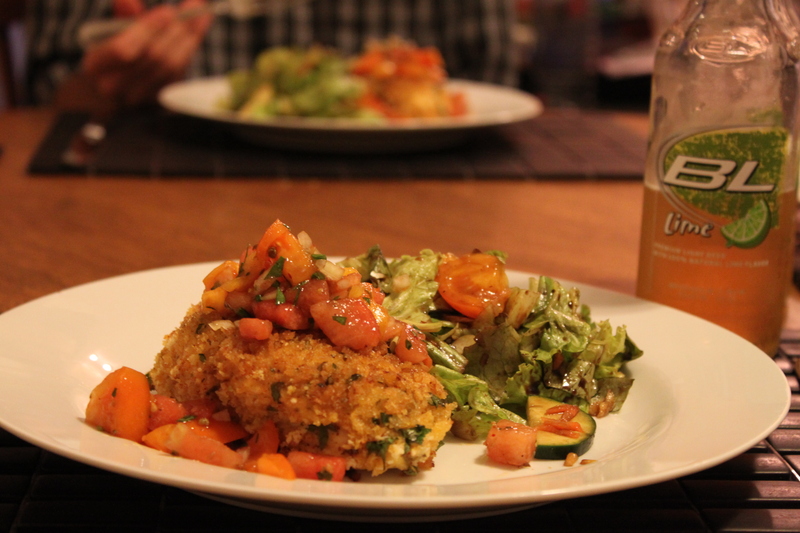 The freshness of the ingredients worked perfectly to cut the richness of the mustard and panko crusted chicken breasts. And yes, that is Bud Light Lime. Don’t judge! So as we get into mid-late august (how is that possible by the way), make sure you’re taking advantage of the abundance of fruit and vegetables available. And don’t be afraid to cook them together!